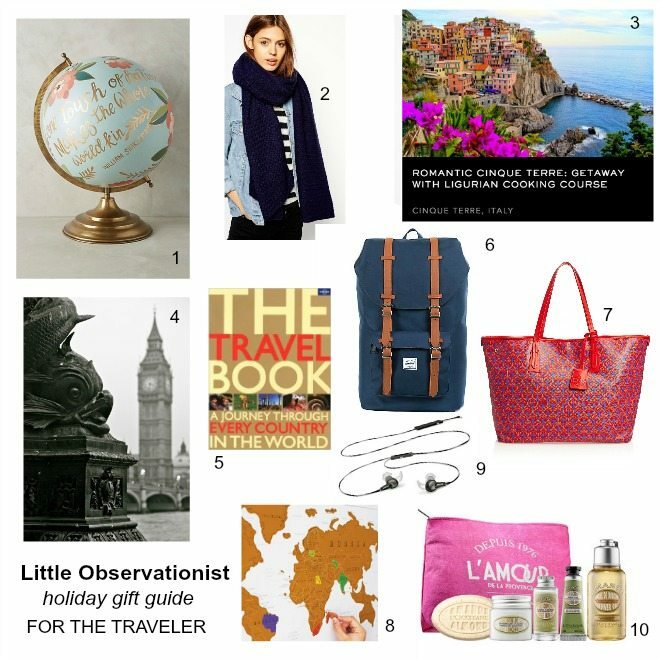 If you’re shopping for someone in your life who loves to travel, there are plenty of ideas to work with, from an oversized scarf to wear on the plane to an actual travel experience (or travel through books) to a pair of noise cancelling headphones. Here’s a bit of inspiration I gathered from around the internet. 1. A globe to inspire wanderlust and daydreams at the work desk. 2. An oversized scarf to wrap up in on the plane. 3. A getaway with a cooking class involved. 4. One of my London photography prints. 5. An inspiring travel book that shows all of the countries in the world. 6. A backpack carry-on for the guys. 7. And a pretty Liberty-print tote that fits everything a carry-on should for the girls. 8. A travel scratch map. 9. Noise cancelling headphones. 10. A bag of travel sized goodies from L’Occitane. What’s on your travel wish list this year?